Denver Spa Committed to Meeting Needs of Cancer Patients and Their Caregivers. LITTLETON, Colo. – Betsy Abrams, the founder of Five Wellbeing Studio + Spa, understands the ravages of cancer. Abrams lost her husband to pancreatic cancer six years ago. His last wish for her was to follow her dream of opening the state-of-the-art spa she had always envisioned. From day one, certifying as a Wellness for Cancer facility was at the heart of Abrams’ dream. 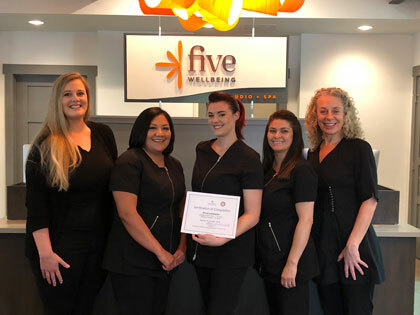 The Cancer Aware program developed by Wellness for Cancer, a Colorado-based 501 c (3) charity, provides accredited training for the spa industry worldwide in working with anyone touched by cancer. Proceeds from the Cancer Aware training fund the charity’s outreach programs. The organization partners with cancer centers, oncology specialists, integrative medicine specialists and wellness professionals to ensure an evidence-based approached to their protocol. Abrams said her entire staff, including front desk guest services and all managers, completed the rigorous training. Five Wellbeing guests who have been touched by cancer are not red-flagged in a separate category. From the moment a guest calls the front desk, the same private conversation begins as with every guest. Individualized notes are made in a guest’s confidential file, the therapist reviews the notes and is prepared to personalize treatment. Five Wellbeing will honor National Caregiver month in November with special promotions. In addition, ongoing package discounts are planned for the caregivers visiting the spa with guests who are directly affected by cancer. Other changes Abrams plans to implement for the wellbeing of all guests include longer sessions to ensure adequate time for individualized treatment as well as adding CBD massage to the spa menu. CBD (cannabidiol) is a compound in cannabis which makes marijuana both medicinal and therapeutic yet is not psychoactive. CBD massage is deeply relaxing while reducing pain and inflammation.